Our intrepid Seabird Advocate, Karen Baird and her partner Chris Gaskin have been in the Galapagos islands in search of the breeding grounds of the storm petrels that live there. Last year, Karen and Chris were part of the team that found the breeding grounds of the NZ storm petrel on Little Barrier Island so their expertise was very much in demand to help pinpoint the breeding grounds of this enigmatic little bird. How was it arriving in the Galapagos? Well, we were a little nervous about the mountain of equipment we needed to bring for our project, much of it essential, including our specially made net-guns which are required to catch these tiny (sparrow sized) storm petrels at sea. 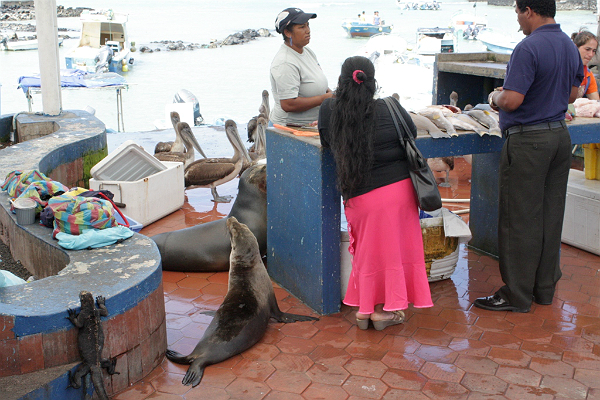 The Galapagos sea lion vies with the young brown pelican gang at the fish market for scraps. One sea lion in particular appears to have pride of place, virtually leaning on the fishmonger as she prepares her fish for sale. One beautifully plumaged larva gull also kept watch, sporting a metal band indicating a study of some sort. We later learned that these gulls are very rare with just 400 or so breeding in the Galapagos. Thankfully, all the transfers went without a hitch. It was here that Darwin came to his revolutionary and controversial ideas around the nature of life which led to his book Origin of the Species. My inspiration for adventure and wildlife, however, came from another one of his books The Voyage of the Beagle, which I read as a teenager. I never imagined that I’d make it here! What is it like on the Galapagos? Do very many people live there? Our first weekend was spent exploring the town of Puerto Ayora on Santa Cruz Island where we are based. Wildlife and people intermingle, not always seamlessly but there is a certain recognition and acceptance that although humans live here, the place really belongs to the wildlife. A sculpture of a waved albatross (unique to the islands) adorns the foreshore and a statue of St Francis of Assisi, the patron saint of all animals. The 18 major islands have a total population of 25,000 people. Is Charles Darwin’s presence felt there? Darwin’s little finches are everywhere in the town, sitting on wires, hopping around on the sides of the road and flicking between trees overhanging fences. It is taking us a while to “get our eye in” to spot the differences between them. I wonder what Darwin would have thought about these little birds becoming habituated to humans. Will a new species of Darwin’s finch Geospiza domestica evolve like the house sparrows we know so well? Our first sightings of the tiny storm petrel we have come here to study was from the long jetty where all the water taxis depart from and the tourists come in from their tour boats to visit the port and its many shops. We saw several storm petrels weaving in and out of the boats and a couple came in very close to us. We were stunned, as our experience of storm petrels in New Zealand is that they are much more pelagic, foraging further offshore. Our first official trip out on the water was a bit daunting. We felt a lot riding on our shoulders – in particular being able to catch the birds with our net guns. Conditions weren’t as calm as usual and we all felt a bit tense. On consecutive trips, we caught a total of five birds over one and a half days, at one stage having to call off capturing when big sharks grabbed our fish attractant (fish bits in a net tied to a buoy) and large frigate birds swarmed in a potential threat to the tiny storm petrels. Later in July, we anchored off Daphne Major at dusk to check for birds coming in after dark. This island was made famous by a two-decade long study by Peter and Rosemary Grant from Princeton University showing for the first time evolution in action as a result of intense selective pressure during drought conditions on the bill sizes of Galapagos finches. Gazing at this arid island (no water at all) it reminded me how dedicated researchers can be, living in difficult situations for months at a time to gather critical information. Did you go ashore in search of nests? Yes, we recently visited a small island at the entrance to Puerto Ayora where we have heard signals of birds nearby at night. Landing is something else! A slippery rock washed by waves. Of course, someone had to slip off and that was me! But we all landed safely and spent two hours scouring the tiny island for signs of burrows, feathers or other indicators of seabird presence. Although we found no signs of the birds here, rocky habitat under dense scrub offers great hiding locations and suggests a closer look is warranted. Are you doing any other tests? 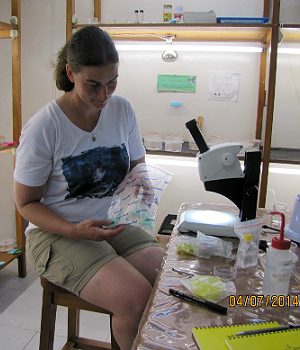 Our colleague Dr Steffi Ismar was here for just one short week, so to make use of her marine expertise we made a start on looking at our diet samples (an opportunistic collection of regurgitations when birds were caught), sorting out zooplankton for stable isotope analysis. This will hopefully tell us whether these birds are sedentary or move away when they have finished breeding. What are you up to over the next few weeks? This week we are continuing the search in the wider Puerto Ayora area before heading away on the weekend to Islas Isabela and Fernandina for 10 days with another collaborator, Peter Harrison, where we will be catching more birds and trying again to track down a breeding location.